A couple of months ago, I explored options for toys that don’t reinforce the car culture, or, to put a positive spin on it, toys that build and reinforce bike culture. Unlike bicycle toys, books about bicycles are relatively easy to find (though still much less prevalent than books about cars, trucks, and other motorized machines), and acquiring said books was my mission this month. This was low-hanging fruit. Gabriel loves “cute-sy George,” and there’s a George book about almost every topic under the sun. 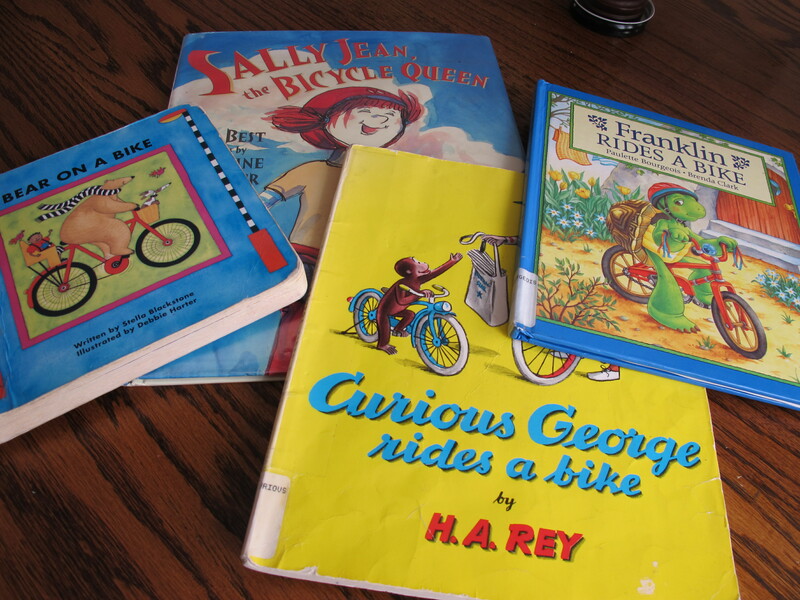 We had previously checked out a cardboard book simply entitled Curious George Rides, and despite the front cover, which features George riding a bike, that book covered various forms of transportation, not just bicycles. By contrast, Curious George Rides a Bike is just what I wanted. I like that the bicycles in the book have practical features, like fenders and lights. This book is similar to Curious George Rides, in that Bear tries various forms of transportation, not just a bicycle. But the bicycle is featured on the cover and in the title, and, once again, we have a nice, practical bicycle, this time complete with a front cargo basket and a rear child seat for Bear’s little friend. A cute story about how Franklin overcomes his fear of riding without training wheels so he can keep up with all of his friends on their bicycle adventures. When reading together, I’ve been focusing on the theme of trying again if something doesn’t work the first time. I rode my “new” bicycle everywhere with great pride . . . . I even pedaled to LaGuardia Airport and rode across the shadows of the giant planes parked on the ground. I used to pretend that my bike was my car. We didn’t own one, and almost never took a vacation. But I didn’t miss going on car trips because I had my bike. Sally Jean not only rides bicycles, she repairs them, too, and the book follows Sally Jean from her introduction to bicycles (riding on the back of Mama’s bike) to building her very own grown-up bike when she outgrows her kid bike. The strong female lead earned the book a place on the Top 100 Mighty Girl Picture Books list. Since picking these books up on Sunday, Sir seems to be at least a bit more interested in riding his own bike, and he is definitely enthusiastic about the books! Any other great kids’ bicycle books that I’m missing? I’d love to add to this list. This entry was posted in Biking and tagged bike culture, go by bike. Bookmark the permalink.